Perth peeps sure do love their coffee, but what we don’t realise is the impact our addiction to the bean is having on our environment. More than 300 tons of coffee ground waste is sent to landfill each year from Fremantle’s cafes alone. OMG! 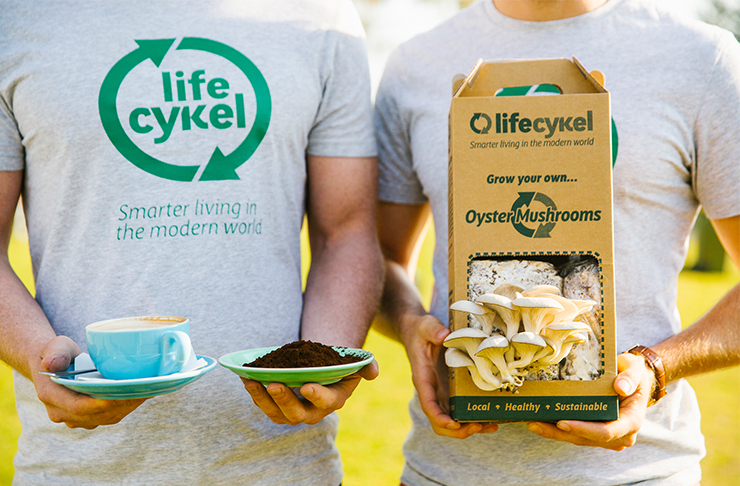 The good news is, clever Perth dudes Ryan and Julian from sustainability company Life Cykel have figured out how to grow gourmet oyster mushrooms from coffee ground waste. On a plight to create Australia’s First Urban Mushroom Farm based in Fremantle, we had a chat to Julian to find out more about the project and whether these mushies give you the same caffeine kick as the beverage! TUL: WHAT SPURRED YOU ON TO START THE FARM? Julian: We came across the idea that used coffee ground is the perfect growing material (substrate) for gourmet oyster mushrooms. So we began experimenting and after many failures we have perfected the art of growing these delicious mushrooms. From here we realised the many benefits that an urban mushroom farm would have on the community. Turning waste into local food, reducing carbon emissions, supporting small business and hopefully inspiring others to start innovative projects that contribute to the well being of the broader community. TUL: WHY MUSHROOMS? CAN YOU GROW ANY OTHER FRUIT OR VEGETABLE THIS WAY? Julian: Ryan and I have a background in health so from our point of view mushrooms tick all the boxes. The mushroom and in particular the oyster variety is one of the most underrated sources of nutrients. Containing B, C and D vitamins as well as being a great source of iron, calcium and magnesium. Many Australians rarely eat mushrooms especially when compared to European countries such as Holland, Belgium, France and many Asian cultures. That is impart to do with the lack of choice, high cost and limited understanding of the health benefits. We aim to address all of these factors. For now, we have only experimented with mushrooms, though I'm sure a little coffee ground added to your veggie patch can only help. TUL: IS THERE ANY REASON WHY THEY ARE OYSTER MUSHROOMS SPECIFICALLY? ARE YOU LOOKING TO ADD DIFFERENT TYPES DOWN THE TRACK? Julian: For some reason the oyster flourishes in the coffee ground. We grow the grey, yellow and pink varieties and hope to add shiitake and a few others to our range. TUL: WHAT DO THEY TASTE LIKE? WILL THEY GIVE YOU A COFFEE BUZZ? Julian: That's an easy one. Delicious! A good description is a mild flavour with a velvety texture. It goes very well with chicken, seafood and pork. We are still trying to grow that elusive mushroom that possesses the coffee buzz. Until then the diner would never know it is grown from coffee ground. TUL: CAN YOU USE COFFEE BEAN WASTE FOR ANYTHING ELSE? Julian: Good question! For both mushrooms and coffee waste, there lies a world of opportunity. Without going into too much detail, London start up bio-bean turns coffee waste into biofuels and a mushroom based company in New York, Ecovative Design, uses agricultural waste and mycelium (mushroom fungi) to grow materials which has been touted as one day replacing the age of plastic. Inspiring companies, check them out! TUL: WHAT CAFES WILL YOU PARTNER WITH IF THIS GETS OFF THE GROUND? Julian: All going to plan we will be collecting the waste from all coffee shops in Fremantle. Some of the ones to show early interest are Roasting Warehouse, Gesha and May Street Larder. The Fremantle local business culture is very supportive and so we look forward to creating circular relationships where we take their coffee ground and return with mushrooms for their chefs to cook. Personally I can’t wait to see what head chef Scott Bridger at Bib & Tucker creates with our oyster mushrooms. One other great supporter of the project is of course the City of Fremantle and Mayor Brad Pettitt—they deserve a lot of credit for allowing such an out of the box idea to be possible. Julian: Ryan and I have been really touched by the support we have had for the idea and believe many people want to see it come to life. By checking out our video, sharing it and supporting our crowdfunding campaign we edge closer and closer to opening the urban mushroom farm in Fremantle. So not only is supporting a campaign or charities a great thing to do but so is supporting local businesses and communities every time you make a purchase. Thanks guys! If you want to check out Life Cykel’s Start Something Good campaign and support Julian and Ryan with kick starting Australia’s First Urban Mushroom Farm, click here.